Creating a script is hard enough, creating one based off an already established story has both its benefits and challenges. From questions of how loyal do you remain to the story, to what do you change to make it A)filmable, and B) your own story, adapting a short story into a film takes more effort than it might seem. The internet loves list, as my Facebook feed proves everyday with the endless barrage of “which character from The A Team/Which color are you” quizzes, and “most disgusting/disappointing/cutest animals” series. So, let’s try something new today with our look into adapting a short story into a short film script. 1. Match the characters to your story. 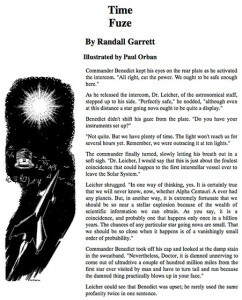 “Time Fuze” (the original short story, written by Randall Garrett) is about a series of astronauts on a mission to test a warp engine called “The Ultradrive”. It’s mainly told through dialog and simple action. There isn’t really anything that happens in the story, plot wise, that makes it stand out. It’s the hook of the story that gets you. The two main characters in the short story, Leicher and Benedict, are the only characters we really interact with. So, my first inclination was that there needed to be more people on this spaceship. I didn’t want to go Star Trek and have the ship with millions of levels. I decided that this would be an experimental vehicle meant only for base survival, and focused mostly on testing The Ultradrive. The astronauts were essentially the first monkeys sent into deep space. I settled on there being three people on the ship. Three characters I would have to cast. Easy enough… Except then it’s who are the three people? The original short presents its main characters as men, probably white, doing conventional white men things. One thing I’ve tried to do in all my shorts is not present my worlds as only one race, only one gender. So, I concluded the main character – Dr. Leicher – should be a woman. She’s the one who’ll carry the story. It’s a role not usually given to women to play. And I think it is an interesting choice as she’s almost always the cool, collected one – except for when she’s geeking out about being in deep space. The other two characters would be men. Captain Benedict, who will be our stoic, conventional man, but underneath he’s concerned what our actions in space mean, and how to put our best foot forward. Last there is Lieutenant Marshall. He’s the guy who is meant to take care of the Ultradrive, and he’s the one who breaks the quickest when stuff goes wrong. We’ve got the “hero” in Leicher, who brings us through the story, assuring us that science is going to get us through it. There’s Benedict, while being the person in command, is almost the most cautious about their mission. And then there’s Marshall, the gung-ho 2nd in charge, who doesn’t quite think too far ahead of himself. They all represent my own beliefs and struggles with the idea of deep-space and humanity’s place there. Which is what the heart of Theoxenia is all about. The Project Gutenburg text of “Time Fuze” by Randall Garrett. Illustration by Paul Orban. As mentioned, there wasn’t much presented in the original story that really made it jump out at you. The story stays with two characters, while unseen others interrupt over an intercom. None of that is visual. The story needed to revolve around these characters, but it also needed to be personal for each of them. The two major moments in the script that I had to create specifically for the movie – which aren’t in the original story – are moments of discovery. For one, we actually see Dr. Leicher make the discover of what is happening to the star they’ve traveled to. In the original story, we blow past that moment, and have it presented as just more exposition. In Theoxenia, I want it to hit home – even if it’s not completely clear to the audience at that moment what it means; they’ll understand that Leicher has discovered something very upsetting. The second one making for a tenser moment in the story, has to do with our astronauts leaving the solar system they’ve traveled to. They attempt to engage The Ultradrive, but it doesn’t work. So, Marshall winds up having to go back and manually reboot it… Naturally, this never works out well for a character. And just to keep the spoilers to a minimum, that’s as far as I’ll describe it. Needless to say, it gets the story moving. Is it possibly a cliche? Yeah, but it’s one that works and hopefully twists into something no one expects. But you have to make sure your story knows when it has to verge away from the source material. Short stories were written to be just that. They weren’t created to be films. So, allow your script to be visual, take chances with the story, and make it interesting. All things that you might have to create yourself. There is obviously a difference between the names of my movie and that of the original story. And that comes down to the universality (pun not intended) I wanted to make the story. I think the point I want to get across in Theoxenia is in the source material, but it comes at it from another angle. And that is where this ancient Greek term comes in. Theoxenia has to do with how in those ancient times, the pantheon of Gods were known to sometimes take human form and guide man along certain paths, or tempt them with gifts and bounty. It was for this reason a principle was devised, called theoxenia, which stated that you should treat all of your guests – or if you are visiting someone else, treat your hosts – like they could be Gods, who can enrich your lives, or destroy it. So, it dawned on me that traveling into deep space would effectively make us guests in those places. And what would it mean if we were to… oh I don’t know, be responsible for the star of that solar system going supernova? If there were Gods around, they might not look too kindly on that. So, give your stories an angle. Have an approach to what it means and how others might take that meaning. But, also take care to not spell things out too much. Or hit people over the head with a message. 4. Know when too big is too much. 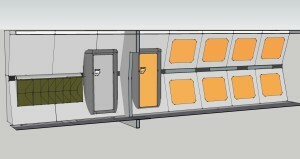 cross-section view of the main corridor in Theoxenia’s set design. As you can see from our teaser trailer, which uses an animated Hubble Space Telescope image; we’re dealing with some spectacular images. (Granted, for the film, we’ll be creating those images ourselves.) So, go into it with the idea of what your limitations are, and build that into the script. I originally wrote in a scene where a solar flare from the star our characters are near, reaches out and explodes a near by planet. THAT IS HUGE! Yeah, it would be awesome, but it’s just a little out of my scope – at the moment. I had plans of making the ship our characters would be traveling in, fairly large, but the constraints of A) having to build all of that, and B) finding a space to do so, is just too much. So, the ship needs to be smaller. But, still recognizable as someplace that three people could survive for an extended period of time. I know it’s usually writers who are looking for guidance, but this message goes out to everyone in filmmaking. Know your limitations! Understand that while your imagination can run wild and writing it on a piece of paper costs nothing. Executing those plans – either practically or digitally – costs someone a lot of time and money. Theoxenia could have easily wound up being 45 minutes long or even 2 hours. Going off the previous point, you have to recognize that you are creating a SHORT film. and unless you’re developing it to be a jumping off point for a feature, a short film should be… short. There were plenty of ideas I wanted to cover, set pieces I wanted to add, and more explosions naturally. But, for one thing, the story doesn’t support all that. I already have a number of special effects scenes, meant as moments to separate scenes and to denote the passage of time, and I just don’t have the time or space to do more than my 16 pages allows. The most important thing to consider in creating a script for a short film is the production. Yeah, if you’re working with an unlimited budget, have access to large sound stages, and can afford to pay everyone good wages; you can have a 15 day shoot and people working 12 hours every day of the week. But more than likely, you’ll not have that. Most short films are being made over weekends, with barebones crews who probably aren’t getting paid – or paid very little – and actors who are almost certainly not getting paid. (Funny that.) These people more than likely have other jobs – especially if you’re not in a film hub like Los Angeles or New York, where many people can get by on sporadic acting gigs and menial jobs – and can’t spend tons of time on set. So brevity – unlike this blog post – is key. A short film almost certainly means a shorter production period. Know your limitations and create a story that best suits them. We’re still running our Kickstarter campaign to raise supplemental funds for the production (and beyond) for Theoxenia. If you enjoyed, or even read, this article please contribute and help us make many more.